Goddess Lakshmi or Mahalakshmi is the consort of Mahavishnu, the Preserver. She is the resplendent goddess of wealth and prosperity who provides the beings with all kinds of material abundance. She is a protector as well as bestower. She bestows upon deserving people according to their past karma and degrees of devotion. She also protects from ill health and adversity. 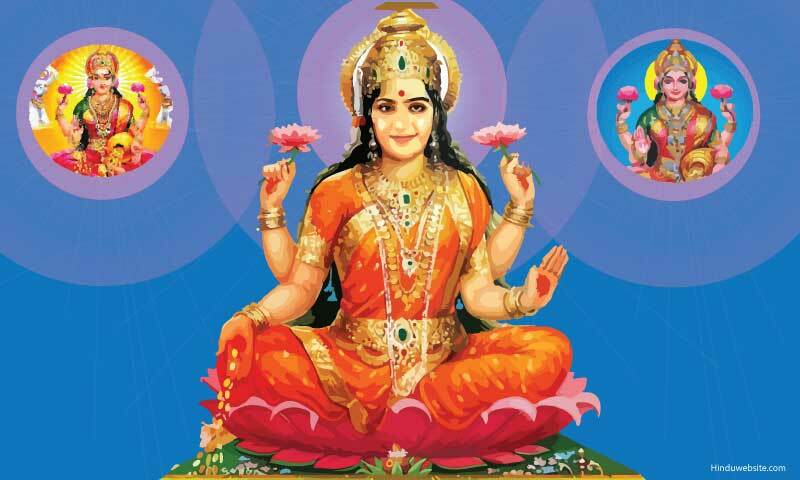 Hence, in Hinduism, worship of Lakshmi is considered a suitable remedy for the alleviation of suffering. Her regular worship, chanting of her names, remembering her believed to bring good and luck and prosperity to people. Wealth plays an important role in the preservation of life upon earth. Hence, as the goddess of wealth, Lakshmi rightfully fulfills her duties as the nourisher, preserver and provider. As per the Puranas, she incarnated several times. In her first incarnation she was born as the daughter of Bhrigu and his wife Khyati. Next she was born from the waters of milky ocean when the gods and demons churned it in search of the elixir of life (amritam) and gifted to Vishnu as a companion and supporter of His Dharma. Whenever Mahavishnu incarnates on earth in a human form, Lakshmi incarnates along with Him and plays her part in restoring Dharma. She incarnated as Padma When Vishnu incarnated upon earth as Vamana, as Dharani when he incarnated as Parasurama, as Sita when he incarnated as Rama and as Rukmini when he incarnated as Krishna. Lakshmi means fortune, prosperity, wealth, good luck, success, accomplishment, beauty, grace, charm, loveliness, splendor, luster, royalty, sovereign power, auspiciousness and so on. Goddess Lakshmi represents all these qualities. Her other popular name Sri denotes wealth (siri), which in the ancient times was represented by the wealth of food grains. The English words cereal was probably derived from Cere or Siri. "Laksha" meaning perceive, apprehend, see, mark, denote, characterize, etc. "Lakshana" meaning a quality, mark, feature or characteristic. "Lakshmi" (la+aksha+mi) may also be associated with the game of dice (aksha), which was very popular in ancient India as is evident from the Mahabharat. Being a game of chance, while throwing the dice, one needs luck, good fortune or the blessings of Lakshmi to win it. The following is the etymology and meanings of the word Lakshmi as quoted in the Wikipedia and originally mentioned in Monier Williams' Sanskrit–English Dictionary compiled in the 19th century in British India. Laksmi representing both good and bad signs or an impending fortune or misfortune is mentioned in the Atharva Veda and Apasthambha Shrauta Suutra. In older Sanskrit, Lakshmi is used in conjunction with "p'uNyA" meaning a good sign, good fortune, prosperity, success, or happiness in Atharva Veda. Laksmi personifies wealth, riches, beauty, happiness, loveliness, grace, charm and splendor in Mahabharata. The word Laksmi as a noun refers to the goddess of fortune and beauty (In the subsequent descriptions found in the Puranas she is frequently identified with Śrī and regarded as the wife of Vishnu or Nārāyana). According to Sir Monier Williams, "Religious thought and life in India", 45, 40-43 she sprang with many precious things from the foam of the ocean when it was churned by the gods and demons for the extraction of Amrta (elixir). She appeared with a lotus in her hand, whence she is also called Padmā. According to another legend, Lakshmi appeared at the time of creation, floating over the waters, sitting on the expanded petals of a lotus flower. She is also variously described as the wife of Sūrya, Prajāpati, Dattatreya and Dharma, as the mother of Kāma, sister or mother of Dhātr and Vidhātr, as one of the nine Śhaktis of Vishnu, as a manifestation of Prakrti. She is also identified as Dākshāyanī in the Bharataśrama, and as Sītā, the wife of Rāma, besides as many other legendary women of great purity and virtue. She is generally depicted in the images and statues as seated on an open eight petaled lotus flower holding lotus flowers in her two hands and holding the other two in abhaya (assurance) and varada (giving) mudras (gestures) respectively. Her complexion in the images varies from dark to pink to golden yellow or white. In the images and her descriptions he is usually associated with water, denoting her association with water. Two elephants stand on either side of her emptying pitchers of water through their raised trunks. Some times she is shown in the company of Maha Vishnu and sometimes alone, showering gold coins upon her devotees. In the company of Vishnu she is depicted with two hands and when alone, she is depicted with four hands, holding lotus, conch, a pot of nectar and fruit respective in each. In some images, as an aspect of Durga, she is also depicted with four additional hands, each carrying a bow, an arrow, a mace and a discuss. When she is depicted with two hands, she is known as Samanya Lakshmi. When she is depicted with two lotuses in two hands and the other two in Abhaya and Varada gestures (mudras), she is known as Varalakshmi. She is also depicted in some images along with Ganapathi as deities of good fortune and auspiciousness. Her vehicle is the legendary owl, which is usually considered inauspicious if it is seen in open or in the houses. We have already explained the symbolism of owl as the vehicle of goddess Lakshmi in the section on symbolism in Hinduism. Symbolically, the owl represent wisdom or intelligence on the one hand and ill omen or bad luck on the other. It leads an unusual and solitary life which stand for loneliness and fear. These two are the common experiences of people who possess wealth and abundance. The goddess symbolizes not only material wealth but also the wealth of all kinds from food to fame and the richness of life. Hence, she has many aspects representing various forms of wealth, richness, abundance, perfection, fulness and enjoyment. Hindu tradition recognizes eight forms of Lakshmi., which are collectively known as Ashtalakshmis (eight Lakshmis), each representing a particular type of wealth. Their names and associated aspect are, Adilakshmi (first), Dhanyalakshmi (crops), Dhairyalakshmi (courage), Gajalakshmi (elephants), Santanalakshmi (children), Vijayalakshmi (victory), Vidyalakshmi (education), and Dhanalakshmi (riches). Of them Gajalakshmi is the most popular. It may be because in ancient times elephants played an important role in wars and clearing forests to facilitate cultivation. They constituted an important part of the royal army, just as battle tanks today, and denoted the might of a king and his chances of victory in a battle. Chance and luck also favored those who possessed them in abundance,. Hence, Goddess Lakshmi, as the source of the wealth of elephants became popular as Gaja Lakshmi. Because of that, she also became an associated deity of Lord Ganesha, the god who possesses an elephant head. There are some variations to the names of the eight Lakshmis. The following one is considered the standard, since it also validated by the Ashta Lakshmi Stotram, which is one of her most popular prayers, and regularly chanted in many households. Adi Lakshmi: She is the goddess of pleasant form, endowed with knowledge and virtue, who grants liberation to the seers and sages, who is worshipped by gods and celestial beings, and who brings auspiciousness and causes rains to fall. In the images she is shown with four arms, holding a lotus and white flag in two, while the other two are held in abhaya and varada mudras (gestures). Dhãnya Lakshmi: She is the destroyer of impurities and adversity, filled with the wisdom of the Vedas, born from the milky ocean, with an auspicious form, giver of boons and loved by Madhusudhana. In the images she is shown as having eight arms, wearing green garments, carrying two lotuses, mace and other objects in her six hands, with the other two held in abhaya and varada mudras (gestures). Dhairya Lakshmi: She is the source of courage, who is worshipped by gods for the flowering of knowledge and wisdom, who removes fear in all forms, in whom the sadhus and others seek refuge and who embodies divine power. In the images she is shown in red garments bearing eight hands, of which six hold different weapons, while the other two are held in abhaya and varada mudras. Gaja Lakshmi: As the goddess of immense strength, she bestows upon worshippers the wealth of chariots, elephants, cavalry and army for victory in battles and helps them to destroy the forts of their foes and achieve victory. In the images she is also shown in red garments, bearing four hands of which two hold lotuses while the other two are held in abhaya and varada mudras. Santana Lakshmi: In this aspect she is the beautiful Mohini who bestows upon worshippers the wealth of progeny for the welfare of the world and for upholding virtue. In the images she is shown as having six arms, of which she holds two sacred pitchers (kalasas) in two, a sword and shield in two, while with the fifth she holds a child who is seated in her lap and with the sixth she gives assurance to the world, holding it in the abhaya mudra. Vijaya Lakshmi: She is the goddess of victory, who shows the right path, grants knowledge and wisdom to the seekers liberation, who grants victory in their endeavors to worshippers, and who bestows abundance of wealth upon those who pray to her daily and extol her. In the images, she is shown in red garments, with eight arms, carrying a disc, conch, sword, shield, lotus, and a noose in her six hands while the other two are held in abhaya mudra and varada mudra. Vidya Lakshmi: In this aspect she is the embodiment of knowledge and wisdom, worshipped by gods, adorned with precious stones, bears a pleasant form, who destroys suffering, bestowing upon her worshippers wealth of nine kinds and fulfilling their desires. In the images, she is shown in white garments, having four arms. Of them she carries lotuses in two and while the other two are held in abhaya mudra and varada mudras. Dhana Lakshmi: Six-armed, in red garments, carries chakra (discus), shankha (conch), kalasha (water pitcher with mango leaves and a coconut on it) or Amrita kumbha (a pitcher containing Amrita - elixir of life), bow-arrow, a lotus and an arm in abhaya mudra with gold coins falling from it. Dhanya Lakshmi: Eight-armed, in green garments, carries two lotuses, gada (mace), paddy crop, sugarcane, bananas, other two hands in abhaya mudra and varada mudra. There are many names associated with her. Dhyana Lakshmi, Saubhagya Lakshmi, Griha Lakshmi, Indra Lakshmi, Padmavathi, Padmaja, Kamala, Sri Devi, Neeraja, Narayani, Vaishnavi, Khshira Samudra Raja Tanaya, Padmini, are some of her other popular names. The opposite of Lakshmi is called Alakshmi, and Bhudevi. She is believed to a goddess of adversity, suffering and misfortune. She was also born during the churning of the oceans, but before the appearance of Lakshmi. Hence she is known as the elder sister (Jyesta) of Lakshmi. Her husband is described as Dussaha, the unbearable, in some versions and Kapila in some, probably a reference to the suffering and adversity ascetics undergo during their austerities and penances. She is depicted as old woman, carrying a broom. However, despite her negative descriptions, she also brings good luck to those who pray to her and earn her grace. Symbolically, Lakshmi represents the materiality of creation and our dependence upon material abundance. Her numerous colors in the images reflect the numerous forms of wealth found in creation. Her dark complexion also represents her association with the earth and also with Vishnu. Her white complexion represent her purity (sattva). Her pink complexion represents her association with lotus and water and her role as a compassionate mother. Her four hands represent the four feet of Brahman, who is usually described in the Upanishads as the four footed. They also represent the four directions, the four types of blessings and the four aims of human life. The pot of nectar which she holds in one hands, represent her ability to liberate people from suffering as well as from the cycle of births and deaths. She is associated with Vishnu, the preserver, because material wealth is vital for the continuity of life upon earth, to perform obligatory duties, to look after cattle and progeny, to entertain the guests and serve those who seek help. Vishnu requires material abundance to carry out his various duties and to preserve and protect creation. Hence, she is always found in his company. In the human plane, similar duties are assigned to householders. Hence, householders have a duty and obligation to earn wealth to maintain dharma upon earth and they have a greater need for wealth and the blessings of Goddess Lakshmi. However, wealth does not come by itself. Knowledge is the basis of wealth and enjoyment. Besides, wealth and knowledge, one also needs progeny. Hence, the three eternal aspects of Mother Goddess, knowledge, wealth and procreation, represented by Sarasvathi, Lakshmi and Parvathi, carry a lot of importance in Hindu way of life. Lakshmi not only represents material wealth but wealth of all kinds. Hence she is also worshipped for abundance in courage, knowledge, strength, victory, material wealth, progeny, education etc. Goddess Lakshmi is worshipped in millions of households, temples and commercial establishments by people seeking peace and prosperity. She is worshipped both ritually and spiritually according to the Vedic and Tantric traditions. People worship her by offering her prayers and food, chanting her various names, or meditating upon her images. Worship of eight Lakshmis (ashta-lakshmis) is also very common. In all forms of worship, utmost emphasis is laid upon personal purity. Worshippers are expected to maintain a strict code of conduct and maintain utmost purity to earn her grace. During such worship it is customary for people to pray to her image or statute or symbols and make their offerings. They recite special prayers specially meant for her (Lakshmi stuti), or chant her names a hundred or thousand times, and seek blessings. In the tantric worship, she is worshipped with mantras. and yantras (mystic diagrams). Some of the important prayers addressed to Lakshmi during worship are: Sri Mahalakshmi Ashtakam, Sri Lakshmi Sahasaranama Sthothra Sri Stuti, Sri Lakshmi Stuti Sri Kanakadhara Sthothra by Sri Chatussloki Sri Lakshmi Sloka and Sri Sukta which is contained in the Vedas. Agastya Lakshmi Stotra. Lakshmi is especially worshipped during Diwali festival by most Hindus with a lot of fanfare. Traditionally Indian businessmen, merchants and traders, open their annual account books after worshipping her in their offices and business establishments on this occasion.